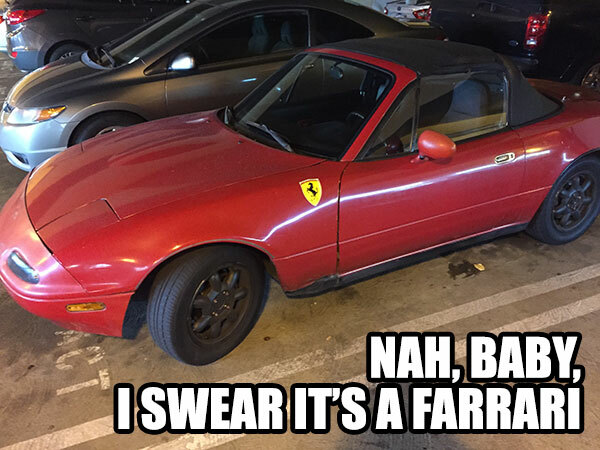 I saw this Mazda Miata in the parking garage of the Dr.Phil show of all places. So many things pulsed through my brain. Could it be a person with a really good sense of humor? I would totally put a Ferrari sticker on my Miata if I had one and my boyfriend would let me. Or is it to fool girls into thinking it's a Ferrari. I guess it's an okay looking Miata. Would anyone fall for it? Either case, worth a meme.